We manufacture a wide assortment of Gear Couplings, fabricated using optimum quality grades material. 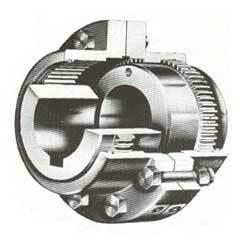 Gear Couplings are made available in fully flexible and half rigid gear couplings. We design the Gear Coupling in conformity to defined industry standards. Full gear type LFG Lovejoy Flexible Gear Coupling contains two identical flanged sleeves with internal teeth, , a set of bolts, nuts and lock washers, a gasket, two identical toothed hubs, a set of bolts, nuts and lock washers, lube plugs and two oil gears retaining seals over the hubs.